The Scratching Post – 2015 Issue No. 3 – Tails High, Inc.
Matty and Dallas have become long term residents of Tails High. It is unfortunate but a true fact that with the influx of kittens each year older cats and those who are very scared and don’t show well at adoption events tend to be overlooked. While these kitties will always have a home with Tails High we want to kick-start a campaign to get them adopted. Read more about these special cats and get the word out to family, friends and colleagues about potentially adopting these sweet animals. Why is this a bad thing, kittens are so cute? Yes they are, and they are practically irresistible to potential adopters but the truth is that the supply far out numbers the demand. Take a look at the graphic on the right. 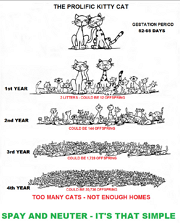 This represents what can happen when one litter of kittens is born and allowed to breed unchecked for 4 years; an astounding 20,736 kittens are possible! Last month we talked about the benefits of having our animals spayed or neutered. This month we want to talk about overpopulation and recent advances that in the future could make the act of spay/neuter much easier on the animals and much more cost effective. Approximately 1.4 million cats are euthanized each year due to over population–which is about 47% of all cats that end up in a shelter. The good news is there has been a 40 year movement to get all pets spayed or neutered and now 83% of owned cats are spayed or neutered. This is up from 10% in the 1970’s according to a New York Times article. And there are non-profit groups and pharmaceutical companies doing research into non-surgical ways to sterilize male cats. Non-surgical fertility control is not a new idea, has been practiced on calves and colts since the 1970’s and recently, this procedure has grown in popularity. The procedure involves injecting a drug into the animal’s testicles, essentially deactivating the testicles. The animal is put under a light sedation, takes only minutes to perform and the best news is that the animals avoid the surgical risks of going under anesthesia and post-operative infection. The drugs used in this procedure are still being tested. There are some drugs that are not yet approved for use in the United States and there are other drugs that have been approved for use on other animals, but more research is needed before it is approved for cats. The drugs are too cost effective. Pharmaceutical companies will spend millions in research and development in order to get these drugs certified by the FDA and out on the market. Unfortunately, at the end of the day the cost of this drug will amount to about $1 per shot and activist groups are finding it hard to get the pharmaceutical companies to take up this cause. Veterinarians are skeptical. Neutersol (a sterilization drug) was introduced in 2003 and failed because it was sold simply as a drug and vets were not taught the proper procedure for injecting it. Little support was given to the veterinarian community to address this and it lead to a lot of animals having adverse reactions. How Much of a Cat Person are you Really? This may seem like a silly question to pose, since this is a newsletter solely dedicated to cats, but we all have our limits on how much we allow our furry friends to take over our lives and our homes. So take this short quiz and find out if you are truly an off the charts cat lover! 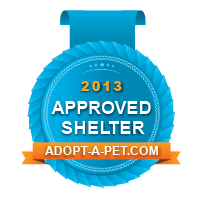 Share your score on Facebook along with pictures demonstrating your love of cats. 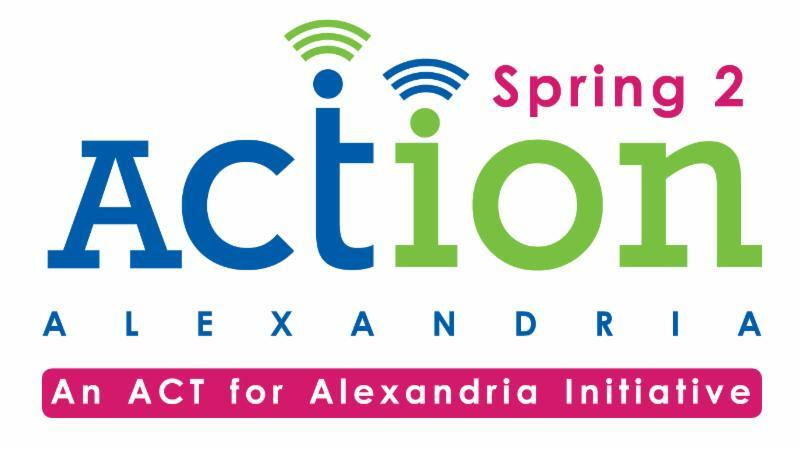 Mark your calendar – Spring2ACTion is on Wed, April 22, 2015. Tails High is once again participating in Spring2ACTion. Last year we raised over $6,000 and this year our goal is to raise $10,000 dollars. Please consider making your pledge to Tails High today. While the event is a month away your credit card will not be charged until the day of the event. This month we want to highlight the local businesses that fundraise for Tails High simply by letting us put donation boxes in their stores. When possible please try and support these local businesses as a way to say Thank You for their contribution to us.